When you drive your car, you want to feel comfortable. You want to avoid having distractions while driving. 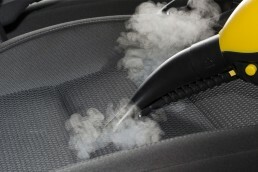 whether that is the odour of spilled milk on your car seat or the car scratches spread all over the bonet. That is why it is important to maintain cleanliness inside and outside your vehicle. Make sure the interior and exterior of your vehicle is in the best condition every time you take it out for a drive with the help of quality car detailing from DITEC DUBAI. DITEC provides quality Car Detailing services you can always rely on. Drawing on the collective experience of our field experts and specialists, we have developed services that are designed to produce the best results for even the toughest stains and cleaning problems you can encounter. We understand that the conditions here in the UAE are unique from that of countries with different climates. One of the biggest challenges when it comes to maintaining the interior and exterior of your car is keeping the sand out. Our services account for the most common cleaning problems drivers have to face today, and address those accordingly. We will determine the most appropriate approach for you by identifying the problem you have on your vehicle interior and exterior. After identifying the material makeup of your vehicle, we will create a car detailing process to get rid of any scartch or dirt without damaging the appearance or quality of the vehicle. This ensures quality results without damaging the vehicle.